I have been making some field comparisons between the new commercially-produced Telinga SoundScape Mic (SSM) made by Klas Strandberg, and my DIY ‘SASS Lite’, with both rigs running via plug-in-power to two identical recorders (Olympus LS10). As many nature recordists are using various versions of the SASS design, the comparison may be of interest. The Telinga SSM mic uses two pairs of Primo EM172 capsules which are described as being flush mounted on aluminium cylinders that are rounded top and bottom. The mics are head-spaced, mounted on a bar, with no divider between them. Klas recommends angling the mics outwards at no more than 15-20 degrees. My SASS Lite is of the same dimensions and shape as the original Crown SASS but is lighter being made of a solid block of closed-cell foam and using flush-mounted pairs of EM172 capsules to each channel. The capsules are head-spaced and angled outwards at about 35 degrees. The unit has a central foam ‘nose’ to mimic the sound shadow effects of the human head. I have made this nose narrower in the front than in the original version, to strengthen the frontal image. Pictured below are the two rigs side by side (shown without windshields), SSM is on the left, SASS Lite on the right. Weight: SASS Lite and SSM weigh about the same, give or take 1 ounce (both are around 1 pound 5 ounces). Windshielding: DIY windshielding for the SASS Lite was a little more effective than the SSM furry windshields at coping with an unexpected gust of wind. For loudness, brightness and tonality the two rigs seem fairly evenly matched. They use the same elements so that is not a surprise. My first impressions are that, even with the widest angle that Klas recommends for the SSM (20 degrees), the sounds are much more in the centre for the SSM compared to the SASS. In my opinion the directions you hear with the SASS are more accurate and you can pinpoint those directions more easily when listening later through headphones. In favour of the SSM, its strong centre image can paint a pretty picture, the rig tends to create a balanced scene even if you have not placed the microphones in a balanced way. To make a visual analogy, the SSM view is (to me) rather like looking at a scene in a convex mirror, the landscape is pre-harmonized and you simply can’t go wrong – just plonk the rig anywhere and it will ‘create’ a pleasant scene for you. In contrast, a mis-positioned SASS can sometimes give a lop-sided image, such is its insistence on sounds to the left or right. In the field I did not notice anything really obvious about level differences for sounds to the rear, nor indeed to those directly in front, both rigs seemed satisfactory. So I did some outdoor tests using a small loudspeaker playing birdsong at a distance of 10 metres using the same levels that I would hear in the field. Compared to the SASS, the SSM gave a 3 dB stronger signal directly in front, and a 7 dB stronger signal to the rear. Those stronger sounds to the rear may be adding to the frontal sounds and thus strengthening and unifying the overall picture. Testing the rigs when set at 45 then 90 degrees to the loudspeaker, I noted that the levels of SSM and SASS were evenly matched for the dominant side. But there was a much greater difference between left and right channels for the SASS than the SSM (4 dB difference for SSM, but 9 dB difference for SASS). This is what helps give that strong sense of direction for the SASS. Using headphones, I also listened for vertical imaging in my field recordings, did birds flying overhead sound as if they were above me? The vertical imaging seemed to work equally well for both rigs. What can be learned about microphone design from this comparison? Perhaps the SASS design could be further improved to strengthen its frontal image whilst still retaining its excellent directional abilities. To do this, maybe the angle of the boundary surfaces could be slightly less than 35 degrees (an adjustable SASS with boundaries that could rotate could be useful for testing this theory!) and maybe a bit more could be shaved off the front of that nose. I wonder if the SSM could be improved by adding a baffle between the mics? Even just thinking about these concepts is useful in developing our listening and recording skills. In summary, I would recommend both these rigs for good quality stereo soundscape recording. As regards cost, the DIY SASS can be home-made for around $60, while the Telinga SSM cost me $715 (Australian dollars). 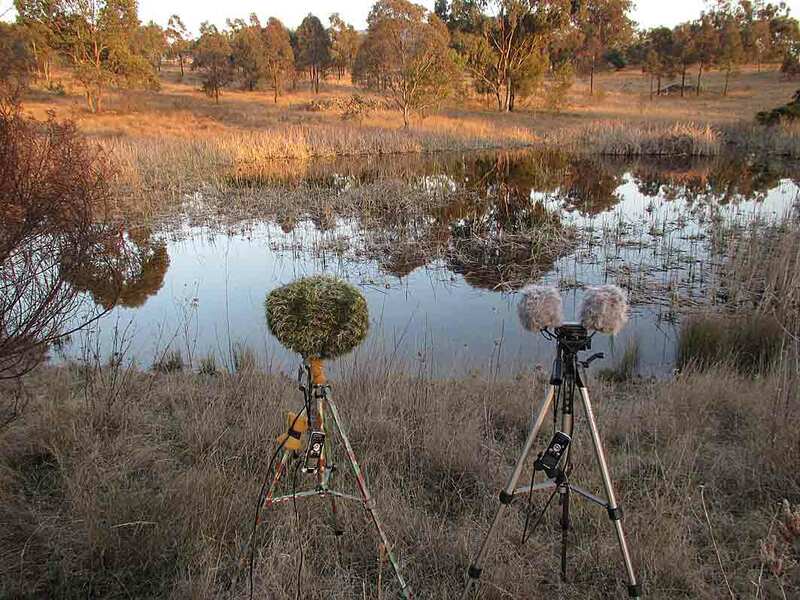 Here is a field test of the two rigs, these simultaneous recordings (each one minute) were made at a small dam in rural NSW, no post EQ had been added. I used two Olympus LS10 recorders, settings for both were Low Sensitivity, Volume 10, no low cut. The Telinga SSM is shown on the right with its supplied windshield. The SASS Lite on the left has a home-made windshield (three layers: lycra, beanie 1 and beanie 2). The angle of the SSM mics was at the maximum recommended by its maker, being 20 degrees. AUDIO – SSM is heard first, then SASS LITE: A comparison of SSM and SassLite, both using twin pairs of Primo EM172 capsules per channel. Both units weigh the same. One is commercially produced, the other is home-made. Not much in it really. The SSM image is more centred than the SASS which has a wider image. Rigs are set up one metre apart, 6th September 2012, early morning near a dam in NSW, Australia (see pic below). Noisy Friarbirds are calling in the distance to the left and a pair of Australasian Grebe call occasionally near the centre. Both rigs are running to Olympus LS10 recorders, levels set at Low 10, no low cut. No filtering, no EQ. File converted from WAV to high quality mp3 for this website.